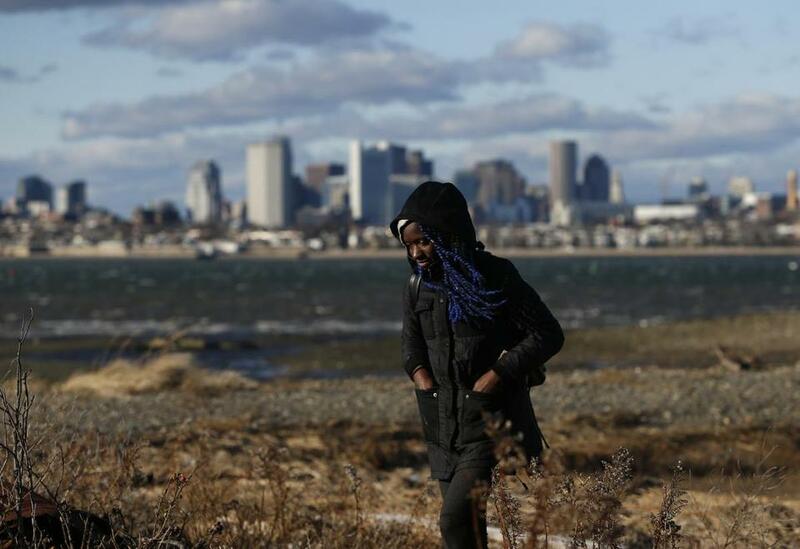 Joye Williams, of Dorchester walked along the shoreline at Thompson Island in Boston Harbor. For 35 years the Friends of the Boston Harbor Islands have been running a New Year&apos;s Day excursion to Thompson Island. The classic hallmarks of New Year’s Day: leftover Chinese food, old movie marathons, all-day pajamas. Or, for some, a couple of uninterrupted hours to explore one of the idyllic Boston Harbor Islands. That’s been tradition for almost four decades for the Friends of the Boston Harbor Islands, an advocacy and education nonprofit that focuses on the 34 islands that dot the harbor. On Tuesday, the group, which is celebrating its 40th anniversary in 2019, ferried about 100 people from Rowe’s Wharf to Thompson Island for a serene start to the year. While perhaps less daring than a fearsome polar plunge into the Atlantic Ocean, those who took the trip said they saw an afternoon on the island as an active way to usher in the new year among salt marshes and sea water. “There are people who are hungover right now, and we get this,” said Kathy Stevens of Jamaica Plain as she walked through woods lining the coast with two longtime friends and camping partners. Tuesday’s visitors were given free reign over Thompson Island, located about a mile off the coast of Dorchester. While a Friends volunteer offered a tour, island-goers were encouraged to explore Thompson’s sweeping meadows, windswept beaches, and historic artifacts on their own. Historically used for farming, and then as a campus for a school for “indigent boys,” the island’s landmarks include the remnants of an old stone food storage cellar, and a graveyard marking the death at sea of about two dozen boys in the 1840s. The island is today generally used for educational programming by the nonprofit Outward Bound. Thompson Island is about a mile out in Boston Harbor off of Dorchester. It’s one of 34 harbor islands. 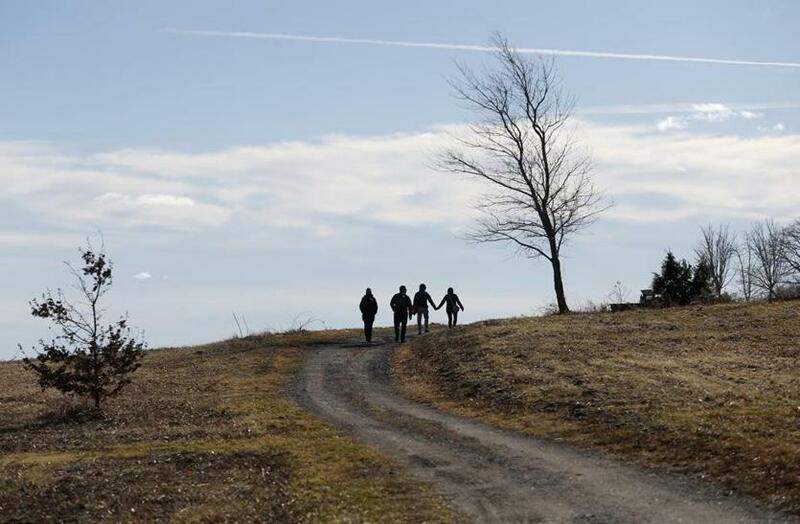 Other groups rang in 2019 with similar hiking and exploring opportunities around Eastern Massachusetts, including at Walden Pond, the Blue Hills Reservation, and the Crane Wildlife Refuge. The Friends have hosted their New Year’s harbor island cruise almost every year since 1980, traveling sometimes to Thompson Island, sometimes to Spectacle Island. The first was scheduled as a way to boost advocacy around improving the harbor at a time when it was far less cared for. It drew enough attendees to become a big event on the Friends’ calendar. The group charters a boat through Mass. Bay Lines and charges $30 for general admission tickets, with discounts for group members, seniors, children, and students. The trip has been canceled due to weather a handful of times, most recently in 2018, when Boston temperatures topped out at 17 degrees. That was far less of a concern Tuesday, with the thermometer hovering north of 50 degrees most of the day. Tuesday’s trip brought new explorers and veterans alike to Thompson Island. Jessica Williams joined her mother and sister for what has become a family tradition that she looks forward to when she comes home to Dorchester from Ohio for the holidays. On Tuesday, the family sat together on a stone structure at the island’s southwestern edge with a breathtaking view of Boston’s skyline. In at least five trips to Thompson together, they said, they had never found this area. Jim Cullinane, a Nashua resident who travels to the various harbor islands at least a half-dozen times a year, said the Jan. 1 hike is appealing — not because it’s the start of a new year, but because there are precious few offseason opportunities to get to the island, which is typically only open to the public on weekends between Memorial Day and Labor Day. “As long as these boats are running, I’d come out to this island,” he said. 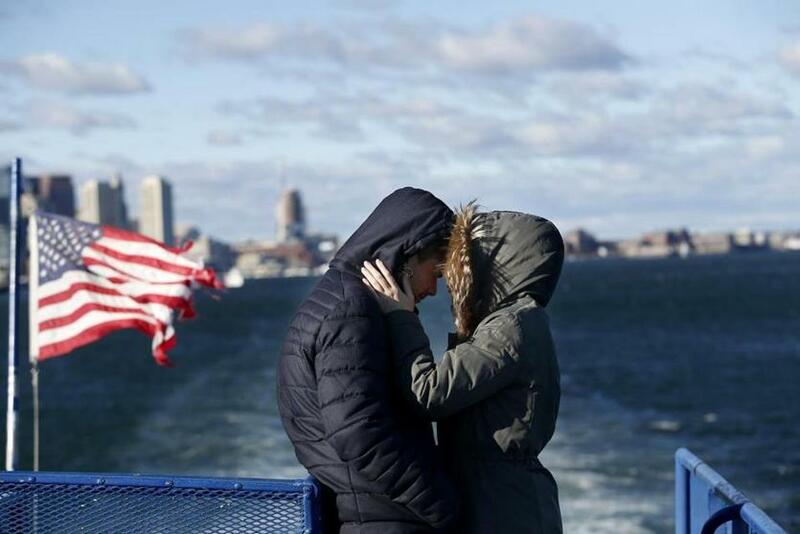 Eva Ritzenhoff, of Germany, right, was with Andre Mendes, of Cambridge, on the ferry ride to the island.